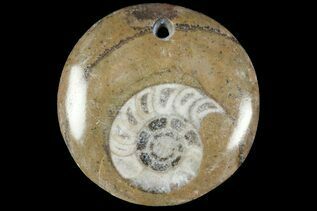 This is a fossil Goniatite, a close relative of ammonites (same Subclass) that has been polished to reveal the inner chamber detail. These Goniatites are Devonian in age and are quarried from the Atlas Mountains in Morocco. You will receive five Polished Goniatite "Buttons" chosen at random from the box. They vary in size and quality but most of the buttons are approximately 1 to 1 1/4" wide and come with a pre-drilled hole to easily make them into a necklace. These bulk fossils are great for educational use, or gifts for kids.